If you are an exotic fruit lover gardening in Florida, you may want to try growing dragon fruit. Originally from tropical America, dragon fruit, or pitaya (Hylocereus undatus) is an epiphytic cactus that grows like a multibranching vine. Dragon fruit thrives in Florida's subtropical climate and calcium-rich soils, and adds interest to any Florida landscape. Get your dragon fruit plant or cuttings from a trusted source. Choose your pitaya variety or species based on color of fruit, sweetness, and whether it is spiny or non-spiny, as well as which varieties perform best in your area. Choose a spot in full or nearly full sun which does not flood. Dragon fruit grows quickly, and can become large, so allow a 15 to 25 feet of space from buildings, power lines or trees. Install a trellis or support that can withstand several hundred pounds of weight. Add 50 percent well-composted manure for most Florida soils. Make sure the area is well drained. Pitaya grow well in calcareous South Florida soils. Dragon fruit thrives in rich organic soils with added manure, but is adaptable to many soil types. Plant a cured cutting directly into the soil or into a pot. Plant potted plants directly into the prepared soil. If the area is prone to standing water during the rainy season, plant the dragon fruit on a mound. Water well, but not frequently. Pitaya have a relatively high water requirement, but overwatering can cause soil fungus and rot. Fertilize four weeks after planting, and every two months for the first year with 1/4 lb. of a balanced fertilizer made for fruit or palm trees. Make sure the fertilizer contains 2 to 3 percent magnesium, or add Epsom salts when fertilizing. Add chelated iron once a year in soils with low or neutral pH. Increase fertilizer amount and frequency yearly, according to plant size. Check for diseases on a regular basis. Several bacterial diseases attack pitaya in Florida, including Xanthamonas, Dothiorella and Fusarium. Anthracnose has been known to attack both the plants and the fruits. Check and treat accordingly for mites, fruit flies, ants, slugs, mealybugs and borers. Birds, raccoons, rats and possums may cause damage to both fruits and plants. 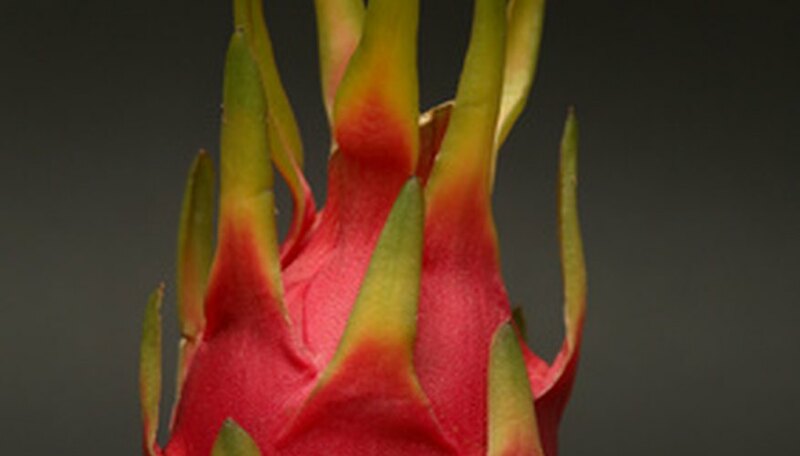 Contact your local Florida Extension Service office for information on growing dragon fruit in your area. Dragon fruit juice has been known to produce allergic reactions in some people. If you have food or plant allergies, please check with your doctor before working with the plants or eating the fruit. Alway wear protective gloves and clothing when working with spiny varieties of the Pitaya plant.